I’d read some early reviews of the Audi Q7 full-size sport-utility and thought them suspiciously glowing, like a parent telling how great their kid’s violin concert had been. Well, count me among the converted. Big sport-utes are generally luxurious land barges that’ll pull a load and haul a load of people. Audi’s new 2017 Q7 will do all that, but in addition to power it delivers ride and handling. The back story is that Audi didn’t make a 2016 model, skipping that model year because it intended this model to be an early 2017 release. It was planning a big upgrade, as in the use of a lot more aluminum in the body and overall structure, cutting 474 lbs. from the 2015 model. Audi also upgraded to a 5-link suspension front and rear and managed to lower the truck’s center of gravity by 1.7 inches. No small feat. All of that adds up to a more manageable ute, one that rides and handles much better than its predecessor. Power still comes from a supercharged 3.0-liter V6 that creates a solid 333 horsepower and 325 lb.-ft. of torque. It’s sufficient to pull 7,700 lbs. of trailer too. 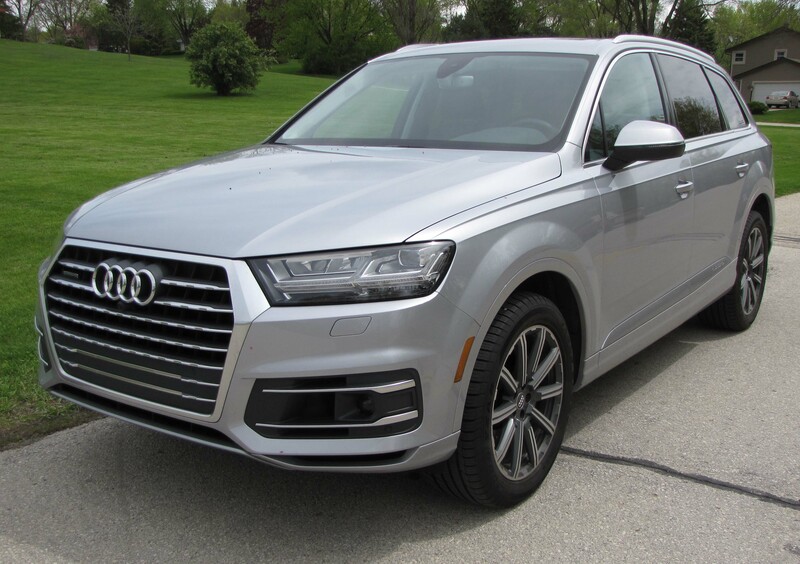 The V6 is linked to an 8-speed Tiptronic automatic transmission that shifts smoothly and delivers enough power to the Quattro 4-wheel-drive system that in the Dynamic drive mode the Q7 actually feels quick. There are four other Drive Select modes, Winter, Automatic, Comfort and Individual. Each can impact the steering effort, acceleration and ride, but Dynamic is the most fun. In any mode the Audi rides like a sporty luxury sedan and adds more fun to the driving quotient than any other large ute I’ve driven. For the record some of its main competitors include Chevy’s Yukon, Cadillac’s Escalade and Infiniti’s QX80. There are others too. But most surprising is the ute’s responsive handling, especially in Dynamic mode where the steering effort is heaviest, but steering wheel play is nearly non-existent. That’s rare in a big ute. This one is easy to handle and put where you want it on the road and the lower center of gravity seems to help steady it in turns. Remember the Quattro system also gives this some serious traction for sloppy winter weather and we usually see a bit of that in Wisconsin, even if this past winter wasn’t snowmageddon. The test truck, the Premium model with Premium Plus package comes with monster 20-inch tires that no doubt could sling some mud, plus fancy 10-spoke wheels that add $1,000 to the bottom line. A lot of room in back and the third row seatbacks power down. 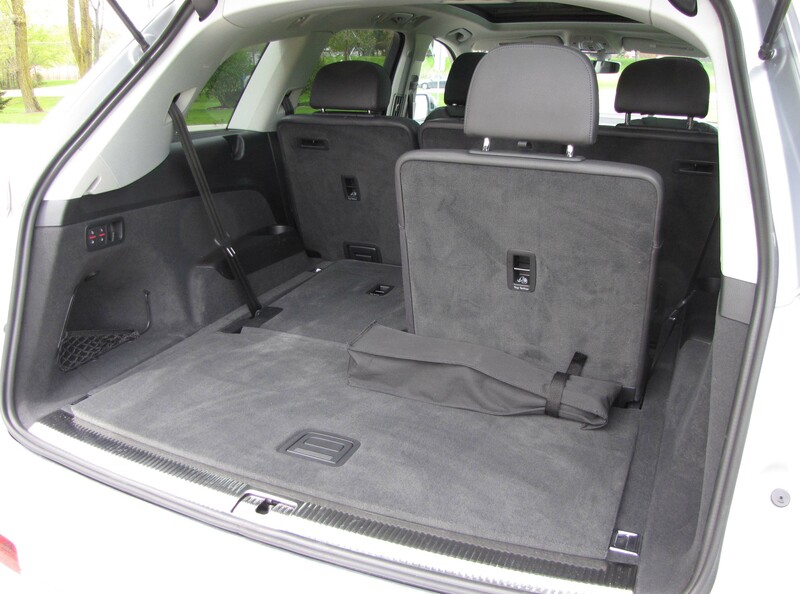 But the Q7 is pretty well loaded to begin with, and the silver test ute ($575 extra for silver) featured a handsome black interior with perforated leather seats that naturally are heated. These are well formed and comfortable with soft-feel leather. Dash trim is what Audi calls double-inlay with both a black gloss and black wood-look trim that goes across the dash and blends into the doors, The console looks like black wood and all of that dark trim is trimmed in a pewter finish, as are the buttons and steering wheel hub. Standard are a huge panoramic sunroof with power sunshade, manual side window sunshades and under the power hatch are power fold-flat third row seats controlled by buttons just inside the hatch’s left side. I like the Q7’s cockpit layout, the cool Audi main gauges and thumb rollers on the steering column for radio functions. One oddity though is a push-button on the gear shift to put the ute in Park. I nearly forgot to punch it several times, instead just pushing the shift lever forward, which in this case engages Reverse. This new system requires some getting used to. Side mirrors are heated and will power flat against the doors, a help in tight parking spots. Audi’s basic sensing system is standard an aims to help you avoid front curb bumps and rear-end dents. Blind-spot warning is standard and flashes in a big way on the inner edge of both rearview mirrors. You can’t miss it. Standard too are twin sun visors for driver and front passenger. Bravo! But note that while a third row seat is standard, legroom is severely limited in that row. So count on only small kids being happy back there. My test ute came with a lot of add-ons too. The Premium Plus package includes Audi’s fancy nav system that you can see on the main dash pod, plus a bigger display screen that pops up out of the dash. The screen also be lowered with the tap of a dash button, improving your front sightlines. 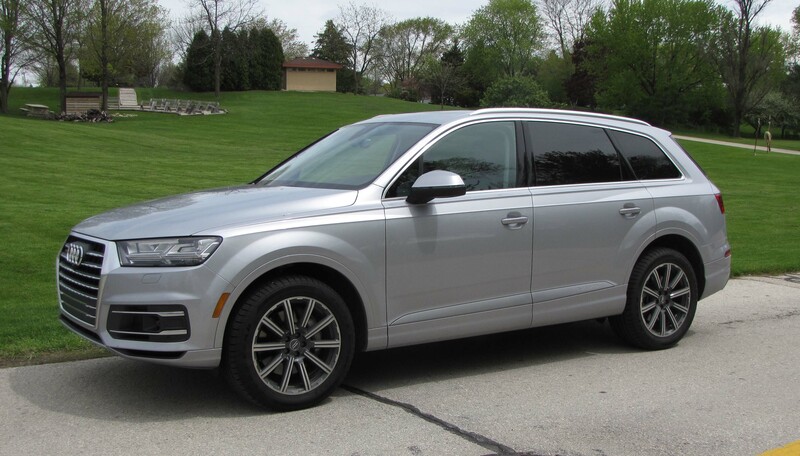 The $4,000 package also includes Audi connect telematics, a side assist system and enhanced rearview system, plus power tilt/telescope steering wheel and LED interior lighting. The backup camera’s screen is large and sits amid dash, but appears to be floating here due to the lighting. 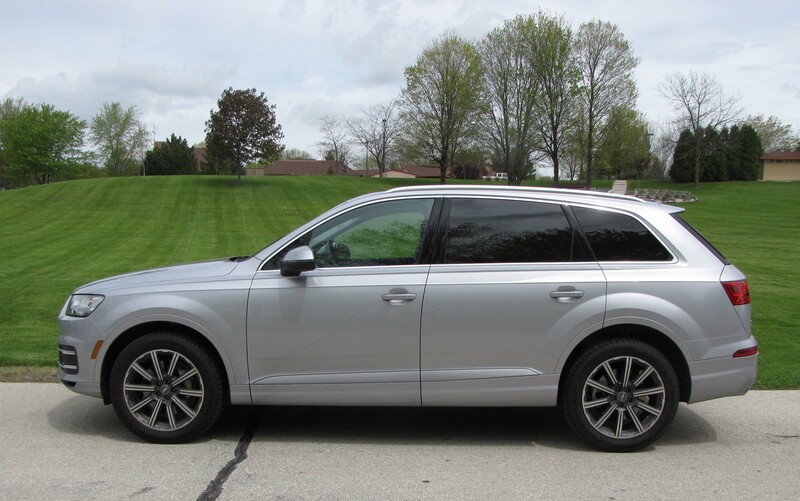 A driver assistance package that goes for $2,400 provides adaptive cruise control with the stop & go system that turns the engine off at stoplights or anytime the Q7 is idling. The package also provides lane assist that can be turned off, high-beam assist that flips on your bright lights on dark roads, and traffic sign recognition to help you know the speed limits and where to stop. Need more? Oh, there’s more, like the warm weather package that includes 4-zone climate control, cooled front seats and power lumbar for both driver and passenger. This package costs $1,800. Likewise a $500 cold weather package adds a heated steering wheel and heated rear seats, a wise investment in our clime. The dandy Bose 3D surround sound system adds $1,100 and a vision package with LED headlights, a top view camera that aids in tight parking spots, and Audi’s cool virtual cockpit instrument panel goes for $2,000. After all that you’re probably curious about the price, which you knew would be high, and it is. Base for this Premium model is $54,800 plus a $950 delivery fee. All the add-ons bumped this one to $68,925. Moving up to the Premium Plus, which this did via a package, adds $4,000 and the top-level Prestige model lists at $65,250 and features an adaptive chassis, air suspension and 4-wheel steering that helps cut three feet off the turning radius. It also includes a system to adjust ride height by 2.4 inches and the Prestige model will lower by one inch while at freeway speeds to reduce drag and aid gas mileage. The gas mileage is pretty good for a large ute too. I got 21.5 mpg in about an even mix of city and highway driving. 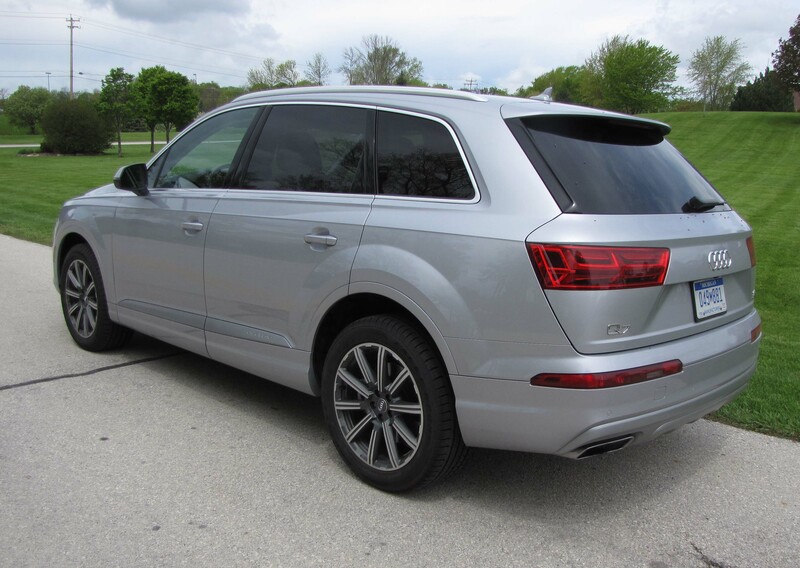 The EPA rates the Q7 at 19 mpg city and 25 mpg highway. Premium gas is preferred, but then this is a premium vehicle. If you can afford the Audi, you can afford the gas. Hits: Power, ride and handling in a big sport-ute, plus it has all-wheel-drive. Loaded with goodies from heated steering wheel and panoramic sunroof to blind-spot warning, heated and cooled front seats, heated rear seats, power hatch, manual sun screens and decent mpg for a ute. Misses: Price will stop most of us, the park button on the shifter takes some getting used to, too.